We're in Wolfville for tonight's game between St. Thomas and Acadia. We'll be on the air about 6:55 on 95.7 The Wolf. The Tommies are coming off a 5-1 loss last night in Halifax to Saint Mary's, while the Axemen beat Moncton last night 4-1. Ben MacFarlane (0-2, 6.37, .817) starts for STU while Kris Westblom (4-2, 3.98, .855) gets the nod for Acadia. The Tommies are 3-6-1 (7 points) on the season so far - in 6th place - just 1 point up on Dalhousie, who beat UPEI last night. 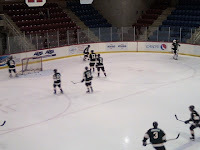 Acadia is tied for 3rd place with Saint Mary's at 6-3-0 (12 points), 1 point back of St. F-X. Don't forget our contest. First person to email me at randy@957thewolf.ca with the Tommies first goal scorer will get a Cold F-X prize pack valued at $75. Good luck.